April, 1945. As the Allies make their final push in the European Theatre, a battle-hardened army sergeant named Wardaddy commands a Sherman tank and his five-man crew on a deadly mission behind enemy lines. Out-numbered, out-gunned, and with a rookie soldier thrust into their platoon, Wardaddy and his men face overwhelming odds in their heroic attempts to strike at the heart of Nazi Germany. I wasn’t sure what to expect from this movie, other than the usual ‘toughest member of the gang learns how to open up to his emotions, the weaker character steps up and realises he has what it takes after all’ cliche crap. 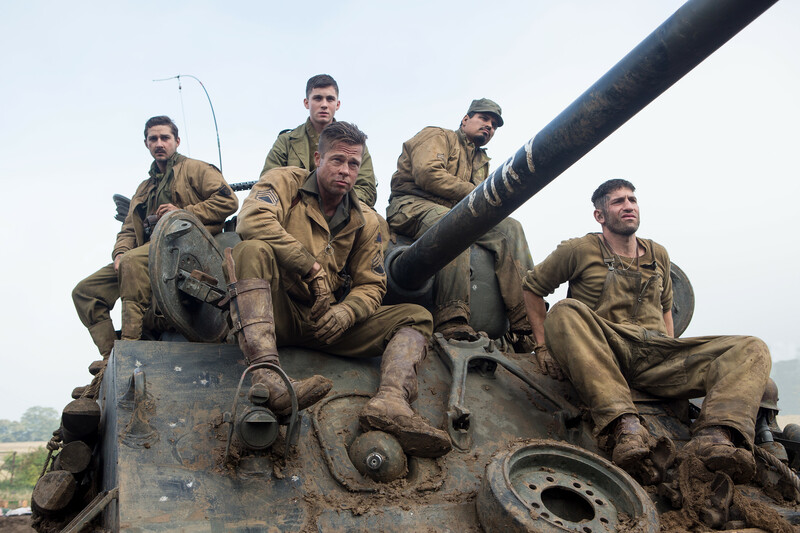 But overall, I enjoyed Fury. It wasn’t overcooked, or underdone – it was just the right length and balanced its dynamics nicely; for example the amount of gore portrayed, was the same amount of tension. With laughs came shocks. Slow scenes were complemented by slick, explosive scenes. I didn’t mind Fury – but I didn’t exactly love it. It simply – happened. I mean, how many times can a movie portray the horrific events of World War II? 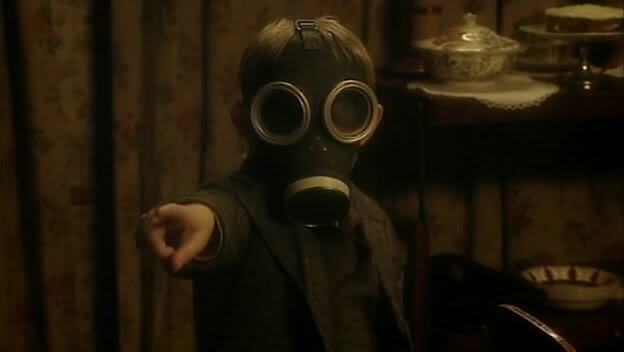 There has to be well over a dozen films out there in the world based in or around World War II that people remember (for me, it was television – that episode of Doctor Who back in 2005 where the child with a gas mask strapped to his face wanders around asking anyone he comes into contact with, “are you my mummy?”.. So most of us around the world know most of what happened during the Second World War, but how many more times can the movies dazzle audiences with another flick about a war? Did this one dazzle in certain areas? Which actor came up trumps? ..and HOW the hell does Brad Pitt still look mid-twenties at the age of 50?! 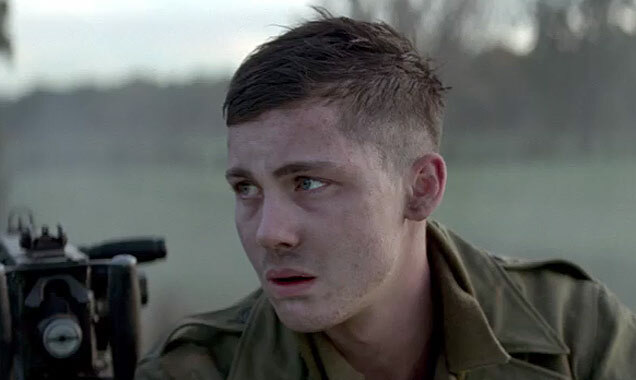 Logan Lerman was my favourite actor throughout the entire movie. His boyish looks and reserved character were adorable. He stumbles onto the battlefield as disorientated Norman Ellison, an Army typist clerk who has never seen the inside of a tank before, let alone held a gun. Recently enlisted, he relctantly joins the gang – with terrifying but life-changing consequences..
Logan won me over from the second he appeared on screen with his green backpack. The actor made a very fine job of playing Norman, the progression from apprehensive office boy to courageous newcomer was great to watch. It boasted a sub-story within the story already being shown on screen which was nice. He brought about dynamics of his own; we had Brad Pitt who will always be the chiseled tough boy, Michael Pena, Jon Bernthal who is naturally aggressive (in looks as well as characters) and Shia LeBeouf who – with that god-awful ‘tash – also displayed such masculinity albeit quite bland in appearance. But Logan splintered the whole macho mainframe by delivering a naive, almost virginal young character. During one or two scenes his acting kept my eyes firmly on the screen, mainly due to Norman’s world-shattering journey from charismatic to corrupt. The man starts off as being bullied by his fellow soldiers once they realise how different a level he is on compared to them. 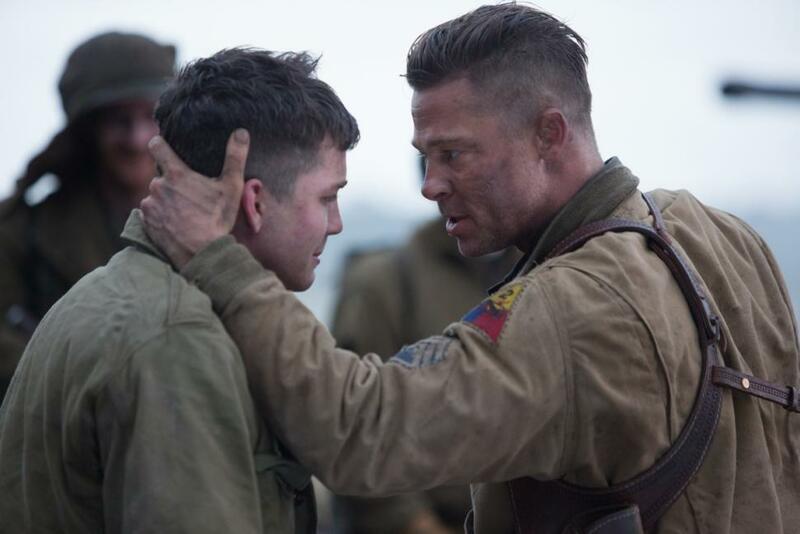 I cringed during the scene where Don Collier (Pitt) puts a gun in Norman’s hand and physically forces him to shoot a Nazi soldier. Norman – under the strain of a headlock from Don – whimpers. Then becomes hysterical. Then kills the Nazi, and starts crying. This was a very powerful scene, in which Logan stepped up and gave a heart-wrenching performance, without going over the top. And the scenes where Norman sits in the front seat of the group’s tank, and has to gun down anything and everything he sees through the periscope. His wide-eyed facial expressions and crying were brilliant. They may not have been Oscar-worthy pieces, but were very effective all the same. 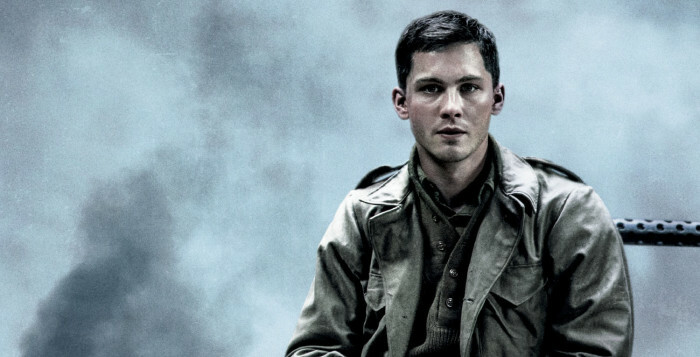 I’ve seen Logan in various movies before, but he was different in Fury. He served up an emotional performance – especially during paternal scenes between him and Brad – which added excellent dynamics and certainly separated the men from the boy. The battle scenes between the veterans and the enemies were actually very good. I don’t usually enjoy war movies, I get bored easily of the wide open dull landscapes and lengthy scenes where army vehicles roll slowly along whilst even longer conversations take place between various characters. 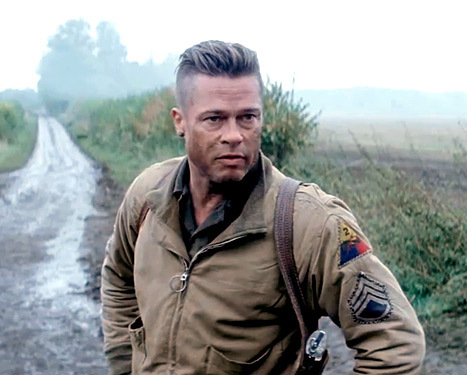 Fury was a war movie with a different feel. It wasted no time in getting down to the gritty action and flowed at a good pace. What talky scenes there were seemed bearable – you get powerful monologues from one or two of the veterans as they reminisce about their service during the war – before moving on to more battle action. Collapsing buildings, rolling tanks, exploding houses, you certainly get your fair share of visuals. And one of the final scenes where the group try to fend off a mass German army sees a farmhouse become a massive fireball as tough decisions and horrific sacrifices are made, and a certain character proves how devoted he really is by performing an act of bravery and risk..
Ok, I’ve mentioned Doctor Who already, however.. 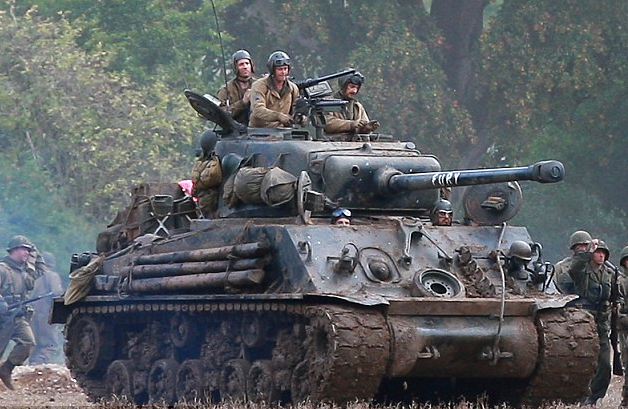 I noticed something during the heavy action scenes involving the M4A3E8 Sherman tank. 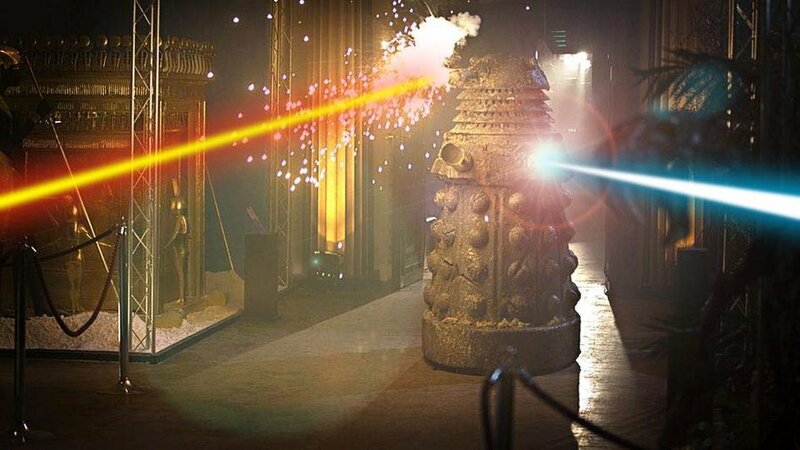 The rays of ammo being fired at the enemy were like the sort of laser beam you’d see shooting out of the ‘whisk’ of a Dalek from Doctor Who. That classic bright colourful beam of death which strikes its victim was similar to what was being fired from the Fury tank. Appearing out of place, you had this classic World War II battle tank wheeling slowly along rubble, whilst 21st century Dalek-style laser beams shot from its stalk. Out of place, out of time. I couldn’t tell if these special effects were supposed to be CGI integrated into the movie, or were literally how the ammunition did fire from the tank in those days. Either way, it was an odd feature – having a 1945 veteran war tank emitting 2014-style lasers. 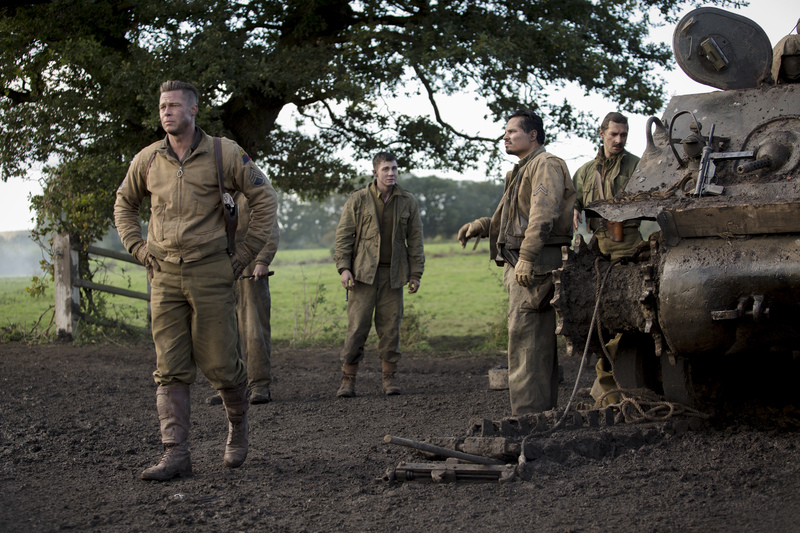 One thing Fury did was make me appreciate what the servicemen of World War I & II did for us. I’ve never really thought in-depth about the perils and highly emotional experiences whilst doing their duty, but as I sat watching this movie, I felt it. I felt every strain, every tear, each terrifying moment. The all-male ensemble really pulled off their performance, in a style which pulsated with the air of dread that is war. 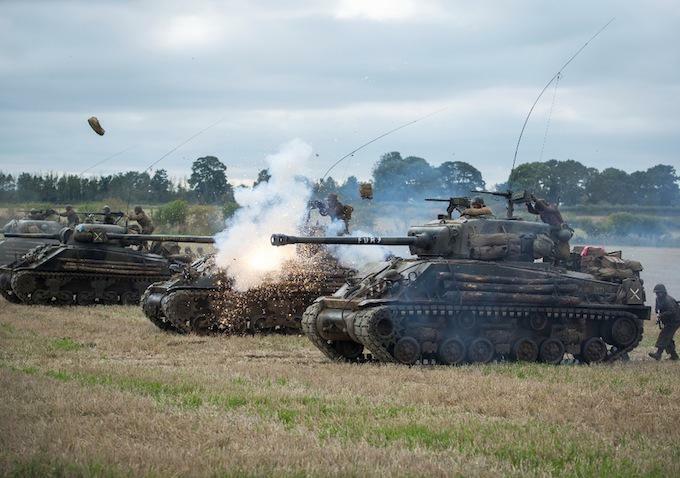 I’m no military historian, but I’m pretty sure Fury captured the emotions of war perfectly; little Norman’s bright blue eyes wide with fear, Boyd telling the tale of when he lost fellow veterans in the line of fire, Don climbing to the top of his tank and declaring it his home.. I felt involved in the moment, and slightly saddened by what I was watching. This was a war movie of a different kind. It didn’t bore me, it touched me. As always, I bring you the good – and the not so good. Although slightly moving, I wondered what the point was of the overall movie. It seemed to begin – introduce the characters – fight – death – then end. 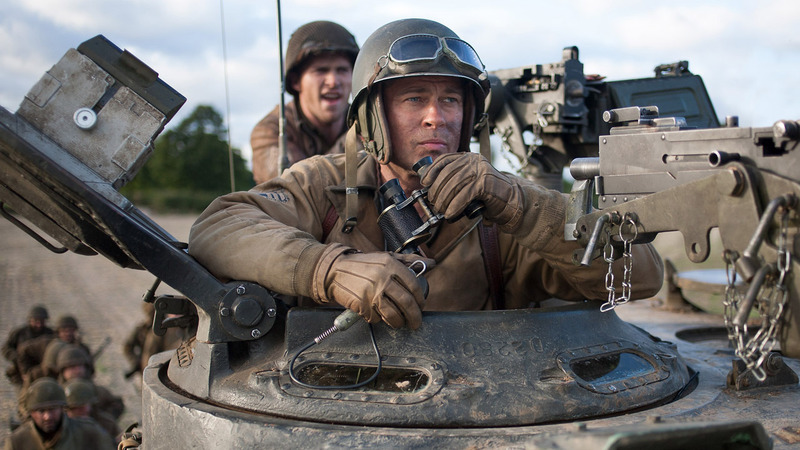 Fury was like a warm-up act for a bigger, more epic feature. To portray how war affects its soldiers – before moving on to the main course. This is my main gripe. I also wanted the scene where the boys’ tank breaks down to be boosted with a bit more tension – hundreds of Nazis march toward them, yet the scenario seemed more relaxed than panicked. Yes, the oncoming storm of Battalion beasties seemed rather doom-like, but something was missing. What could’ve been a fantastic game of Cat & Mouse was actually rather relaxed. I’m half and half with this one. 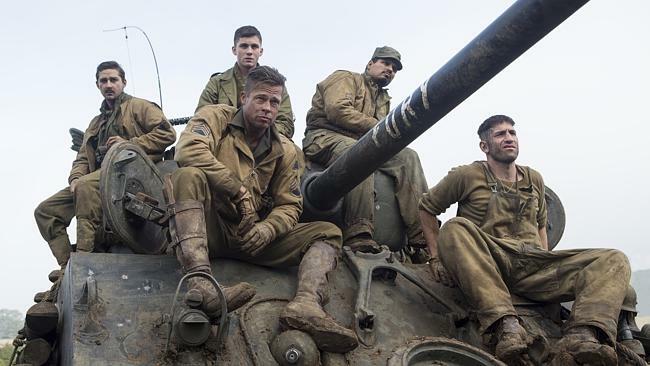 Fury was definitely one of the better war movies I’ve ever seen. It was quite short and lacking certain elements, but at the same time it remained punchy and in full flow of its portrayal of World War II veterans and their gritty experiences. 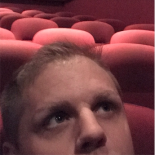 As you have probably gathered, I was moved by the movie due to its raw and emotional scenes involving the younger soldier and his own personal battle between a normal life and going to war. 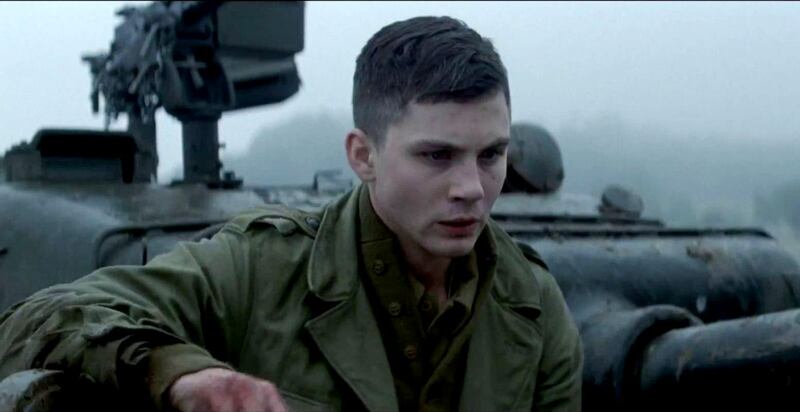 He was torn from his office and dumped on the battleground, and Logan Lerman played it very well. 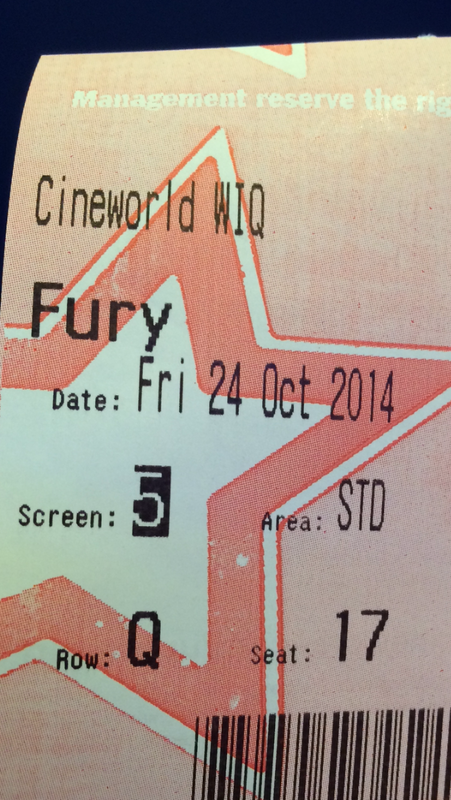 It may not be an Oscar winning, groundbreaking production but Fury manages to entertain as well as inform. A sort of, “here you are – this is what it was like” movie. This entry was posted on November 1, 2014 by rickysfilmreviews.